Life is a process. I admit, I sometimes forget that. Often, I find myself so focused in on my list of tasks that “must be accomplished today.” Or maybe I’m so lost in The Matrix that all I can even concentrate on is getting through the day. As if happiness is just on the other side of this thing called living daily life. We’ve all been there. Losing sight of the bigger picture brings stress. When the connection to daily purpose is fractured, the demands of regular life can become exceedingly draining. 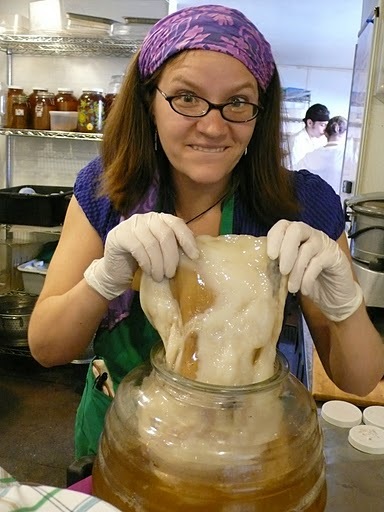 …when Monday at 4pm rolls around, it’s Kombucha brewing time! 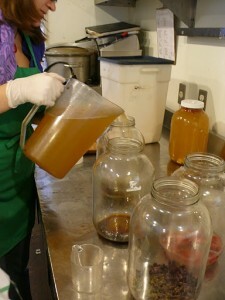 I don my apron, roll up my shirt sleeves and wheel the Kombucha jars to the kitchen. Here I am the queen!! My domain: I know each smell and flavor, all the steps in the proper order, each piece of equipment feels just right in my grip, my mind tosses new potential flavors about; I’m deep in the brewing flow. This process grounds me, and I release all the other millions of projects and tasks that I have to sort through on a daily basis in this moment. Being my own boss means I’m in charge and sometimes, I wish I could fire myself! But all that judgement and anxiety melt away when I’m with my SCOBYs. 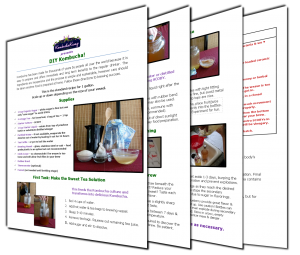 Brewing Kombucha is simple – an easy dance – boil water, fill tea balls, measure cups of sugar. 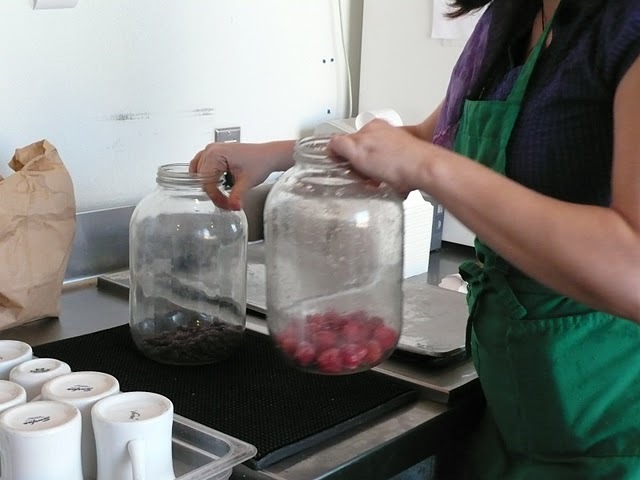 I cut fresh fruit (strawberries and peaches are in season now), pick herbs from the garden and pull out my apothecary jars bursting with smells and textures – flower petals, ginger root, chai spice and more. Like a good witch over her cauldron, I mix magic potions. The easy flow relaxes the mind and realigns me with my purpose. 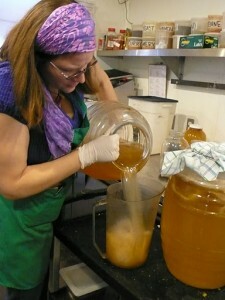 The labels of my existence peel away in layers – Kombucha Mamma, teacher, fermenter, entrepreneur, woman, human. 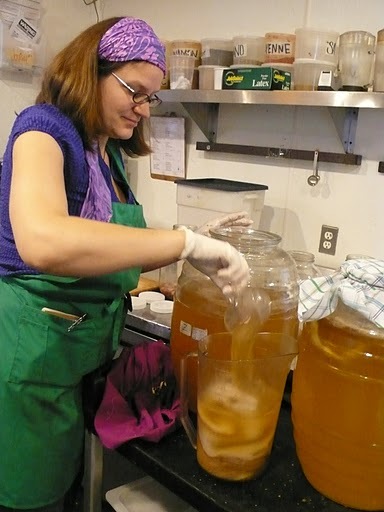 I cultivate and tend my bacteria/yeast tea – a tradition that has been handed down for centuries, millenia perhaps. I envision the women and men who have stooped over their pots, lovingly adding fresh cups of sweet tea to feed this creature that grows into a kind of friend. And through this simple process, I am instantly connected to all people across time. The jars are now filled with fragrant Kombucha, the fresh batches of still sweet tea are returned to their shelf and the apron back on the peg. I reenter my daily life knowing that there is a rhythm to the chaos. I remind myself – Life Is A Process – when I focus on the bigger picture, it will guide me through the jungle of minutiae. We have just experienced the Summer Solstice (from the Latin meaning “sun” and “stand still”), also the longest day of the year, when the sun is at its highest point in the sky and seems to stand still. To honor this time of year, I take a moment to be still and ponder process. I invite you to do the same and consider how making Kombucha offers an opportunity to connect with your own process. Thank you to Victoria C. for taking the wonderful pictures at Leaf Organics, where I serve as Master Brewer. What’s your Process in life? How do you get back in touch? Wow I really love how you connect through kombucha and get grounded. It is so true that the process is often what we tend to ignore and forget but which is actually the most important aspect of all. Sometimes with all this blogging and information, people and places, I don’t seem to have time to cook and just relax in the kitchen getting creative with food…. As the world speeds up I do my best to slow down and yet can’t seem to avoid feeling the anxious urge to do, do, do… But we just got back from a couple days retreat to the Island and I am feeling more able to get back into the madness….ever made kombucha with coconut water? 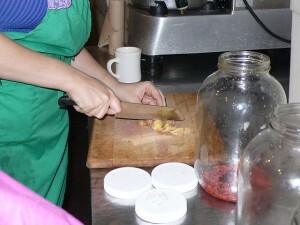 I’m inspired to go home and try another batch!